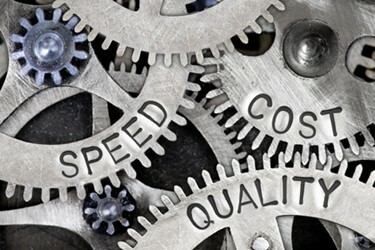 Many of you have no doubt heard someone in your current or past organization say, “Quality, cost, and speed — pick two.” This statement refers to the perception that a project cannot achieve all three areas as priorities and therefore the organization must choose which two out of the three to prioritize. Companies want to achieve goals/milestones on time, and clinical trial teams are under intense pressure to achieve key milestones, such as first and last subject enrolled, last subject last visit, database lock, and topline results, on time. Biotech and pharma company senior leaders are also under intense pressure from key stakeholders such as investors, stockholders, and the board of directors to contain costs and deliver a return on investment as quickly as possible. These types of pressures tend to start early and continue to exert influence throughout the life cycle of a project. A “win” is considered to be achieved when trial milestones are achieved on time and within budget. Although all organizations will state emphatically that they are highly dedicated to quality, sometimes the quality part of the equation is not the primary focus of the organization. This is due, in part, to the fact that enrollment numbers and financial spend/revenue are clearly measurable outcomes. But how do we measure quality? Is it the results of site audits, or data query rates, or SOP adherence? The issue is not unlike the difference between measuring blood pressure and measuring pain; the former is an objective, numerical representation consisting of systolic pressure over diastolic pressure, while the latter is a subjective expression of perceived discomfort. Not only is it difficult to convey the pain I am experiencing, but my pain from an underlying disease or condition will be different from another person’s experience of pain due to the same disease or condition. Similarly, my idea of high quality will likely differ from the opinions of others in my organization. Finally, it is not always clear who in the company “owns” quality oversight. 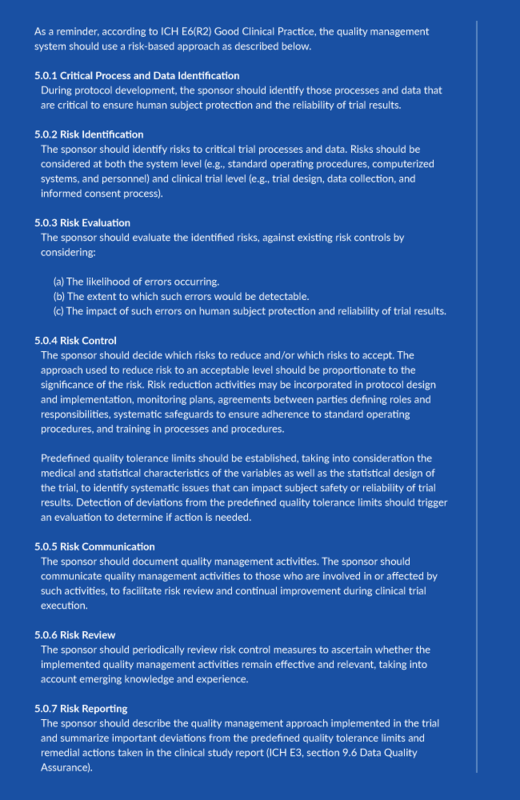 As I mentioned in a previous article, it is critical that companies decide early on who in the organization is responsible to lead the clinical quality oversight effort: the quality assurance/operations/systems group (herein, QA) or clinical operations. While the QA group has the word “quality” in its title, we all are aware that everyone in the organization is responsible for quality, just as everyone in the organization is responsible for subject safety. Safety reporting and management is usually led by a pharmacovigilance group in which the processes and reporting requirements are clearly defined and rigorously adhered to. In contrast, the QA group may be focusing on SOPs, training, system validation, and documentation of all the above, rather than direct oversight. However, who in the organization has the knowledge, based on education, experience, and training, to oversee the clinical trial activities? It is clinical operations, of course. We all routinely do quality work if we are educated, trained, and experienced to conduct the activities we were hired to do. But the art is in translating the actions we take every day into a tracking system that can identify, measure, assess, mitigate, and document risk management. In smaller, more lean companies and in larger companies with resource constraints, task allocation becomes a critical process. Most companies have too much work and too few resources, so a close working relationship among all functional areas and their QA colleagues is a critical foundation on which to build and cascade out the necessary processes, activities, and documentation required for the day a prospective partner, buyer, or regulatory inspector comes to visit. Why do I focus on clinical operations when other areas of the organization are also critical to QA, since their tasks and activities are able to be inspected by regulatory authorities? Because clinical operations teams have the closest relationship with and responsibility for the sites (and as an extension, the subjects) in our trials. They are tasked with the oversight of dozens of processes, documents, and milestones. In addition, with the industry’s move to so many e-platforms and e-processes, clinical operations teams need to have a solid understanding of all the technologies they are responsible for overseeing. Outsourcing practices obviously take some of the day-to-day burden off clinical operations teams, but the responsibility for the trial lies with the sponsor, not the CROs. I have many times stated the mantra “quality, cost, and speed — pick two!” as if senior management would magically shift its focus from speed and cost onto something as diffusely defined as “quality.” What I have learned is that one grows the awareness and the prioritization of quality across the organization in a creative, organic, and yet clearly planned and proactive fashion. No one person can check a box of “quality” and be done with it, because like every aspect of clinical trials, the path forward can take many twists and turns. QA colleagues need to be deeply imbedded in the clinical team to ensure they are supporting the team appropriately. The clinical team should communicate early and often with QA and ask if they feel the quality of the activities is where they believe it should be and whether clinical operations can assist in ensuring that inspection readiness is achieved and maintained. The bottom line is this: if you are in clinical operations, make sure you know who in your organization is conducting which quality tasks and where and how this work is documented. Don’t wait for anyone else to identify a gap or need — be proactive and speak up if you cannot go to sleep at night knowing every task you are responsible for is being documented in an appropriate fashion.